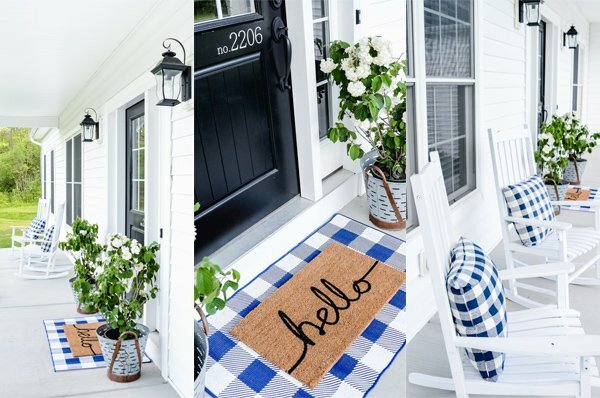 I grew up with a big front porch, and I’ve loved them ever since I was a child. I love having one at Old Salt Farm, and being able to decorate it all year long. Yes…even in the New York wintry months! 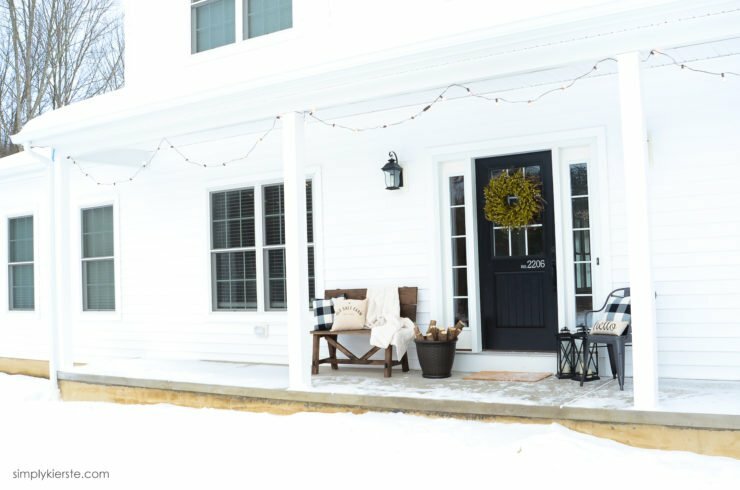 A winter porch can be just as cozy as a summer porch, and I absolutely love how it came together. 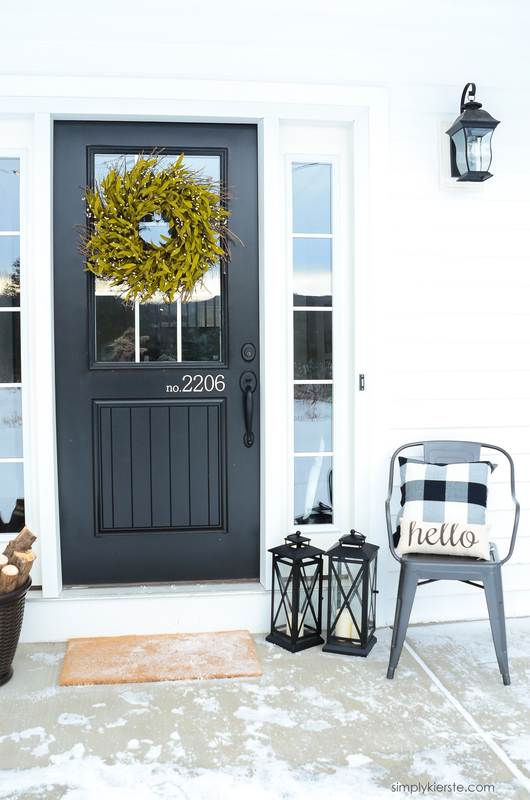 I used the same patio decor that I do in the summer, with just a little twist, making it cost effective and simple–just my thing. 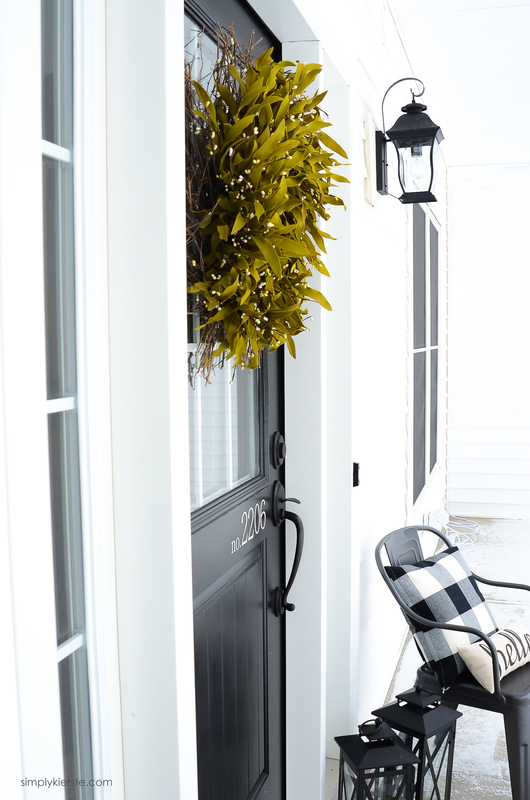 I like being able to use and reuse–to save money while decorating. The fact that I can use my favorite summer items through the winter makes me very happy! 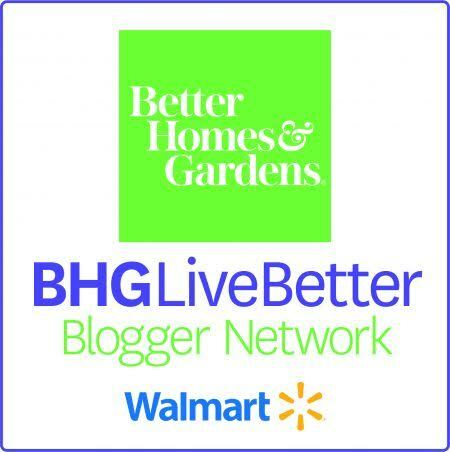 Thanks to Better Homes & Gardens for sponsoring this post, and as always, all opinions about their super cute product is 100% mine! Affiliate links are included below. 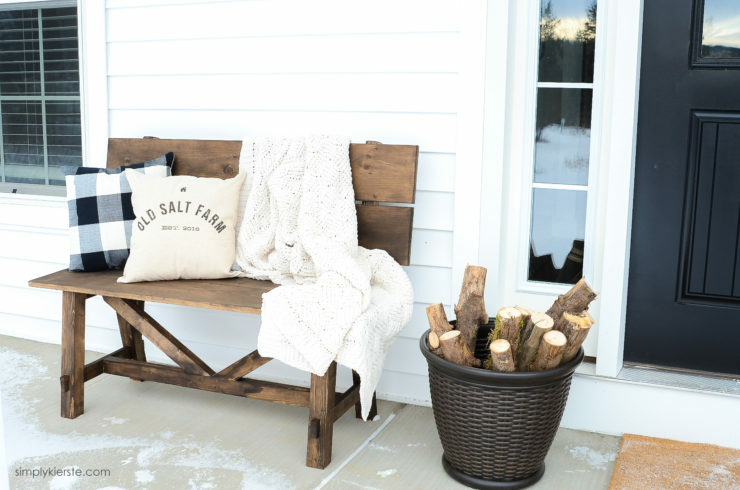 I loved these Farmhouse chairs the minute I saw them, and knew they would be wonderful both inside and outside. 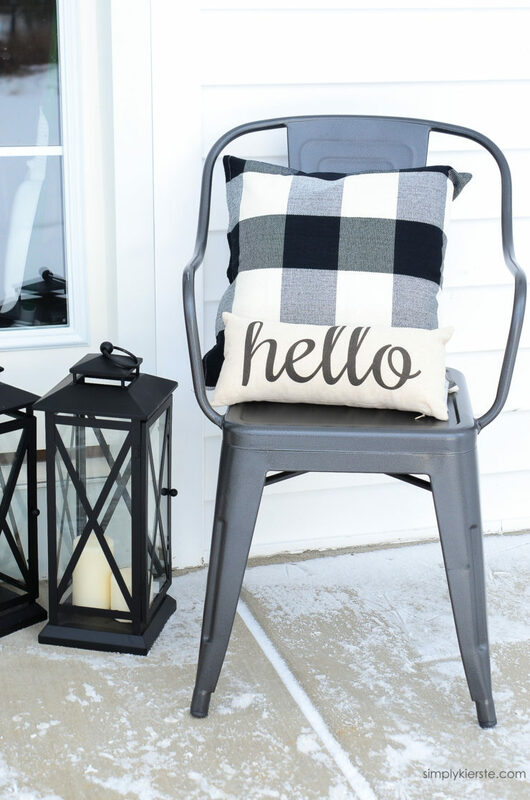 They’ll be perfect on my back patio during the summer, but right now I love this one on the front porch with a cute hello pillow and my current favorite black buffalo check pillow (two for $11!!!). Oh, and did you know they’re stackable for easy storage? That’s the best! 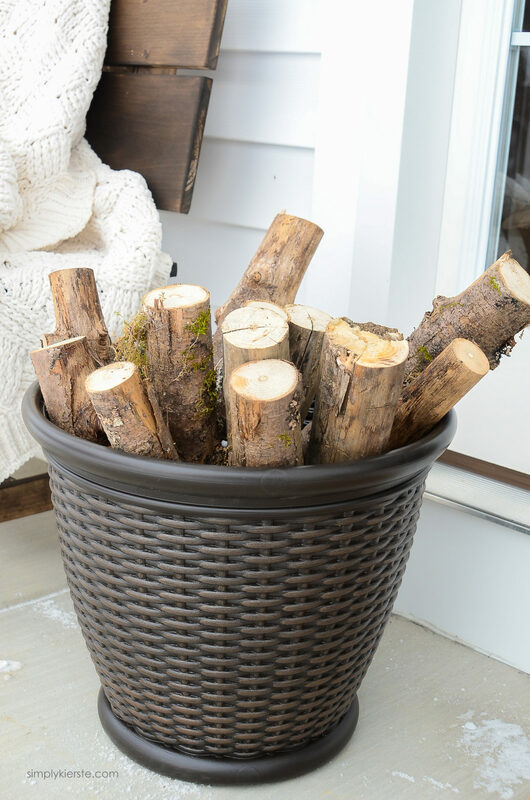 These adorable faux wicker planters by Better Homes and Gardens are a great size, and I thought they would be perfect with logs of wood for the winter. LOVE! It adds such a cozy touch–and so simple too. They make an easy transition to spring and summer when I plant my flowers, so I’m using them all year long. Notice the lights? We live way out in the country, and it’s really, REALLY dark at night. The globe lights give us a little more lighting at night, plus they just look super cute! We used command hooks with little cup hooks on the back side of the porch ceiling to hang them, which makes it super easy to put them up and take them down. You can get them at Walmart–they’re by Better Homes and Gardens–at less than $10. 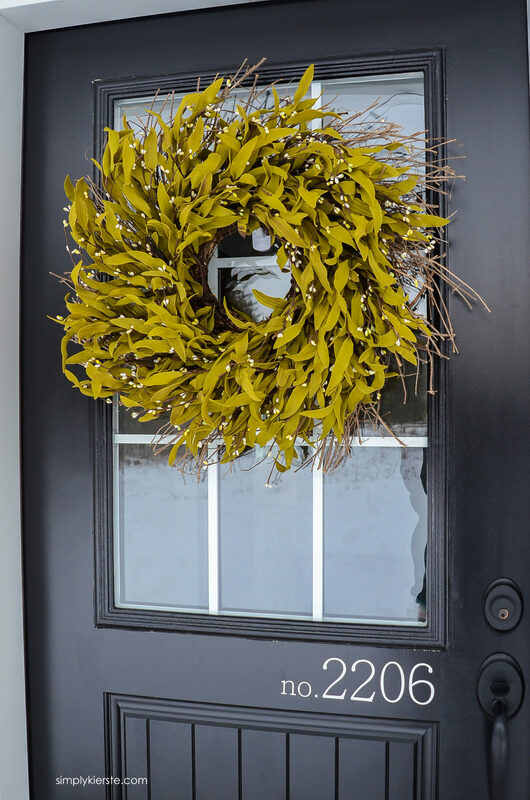 A wreath is a must on my front door, and I have one up all year long, just switching them out for the seasons. 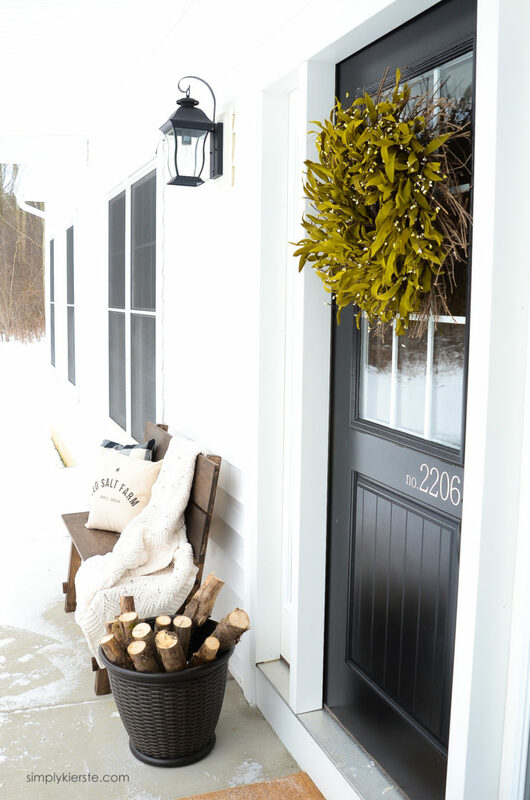 In the winter, I love adding some greenery for color, and this wreath is wintry perfection–greenery, twigs, and little white berries. We made the bench for this porch, to fit the space between the window and door, and I simply adore it. After some internal debate about whether to paint or stain it, I went with stain, and I’m so happy I did. It looks darling with or without the pillows, but I’m a little partial to them. 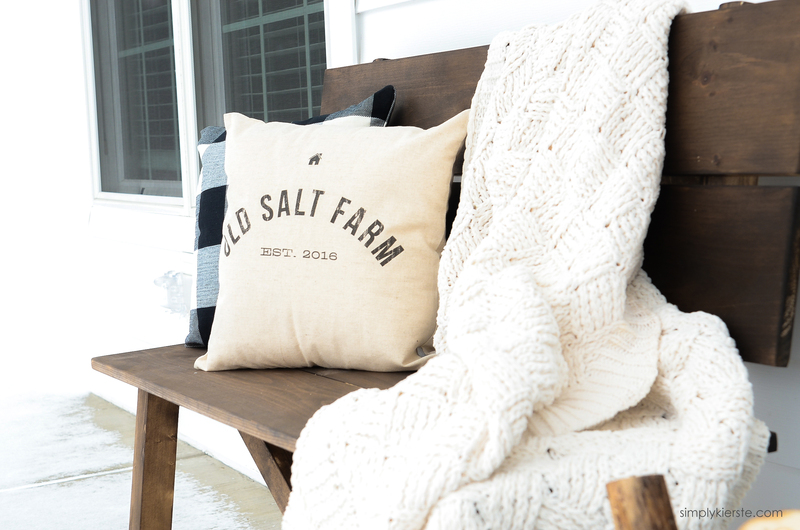 An etsy shop made the Old Salt Farm pillow for me, and now I can’t decide if I want it inside or outside. Maybe both! 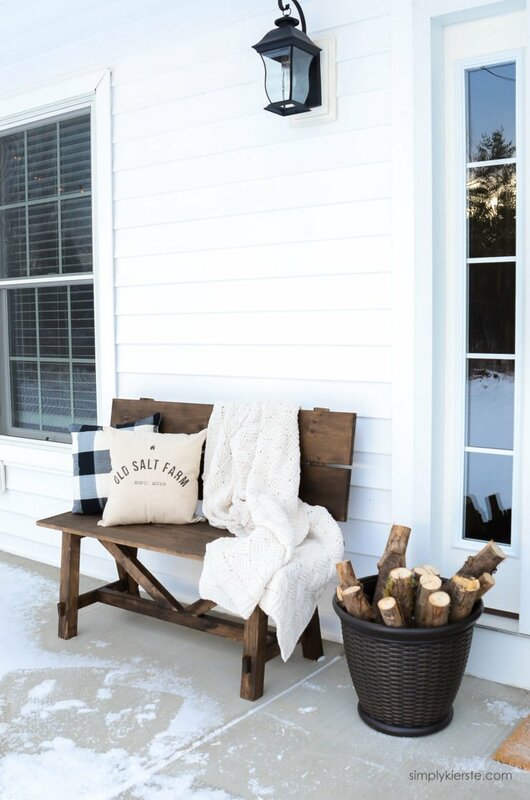 Snuggling up on this bench with cozy blankets, mugs of hot chocolate, and a good book while watching the snow fall? Can’t be beat. 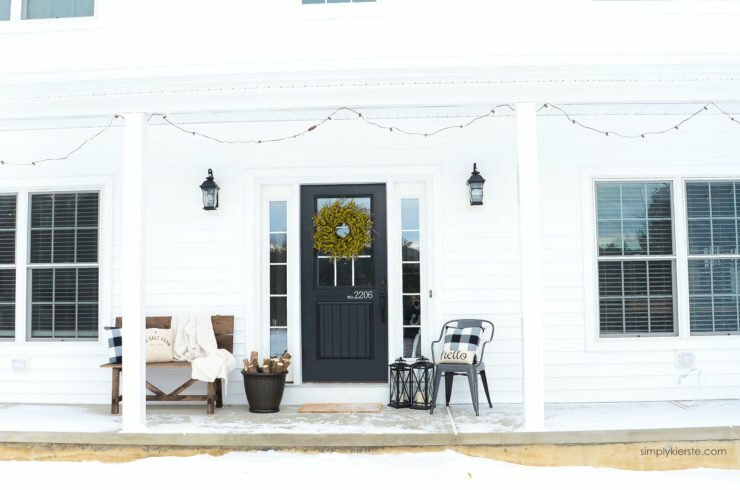 I love our winter porch! Next up? A porch swing!! 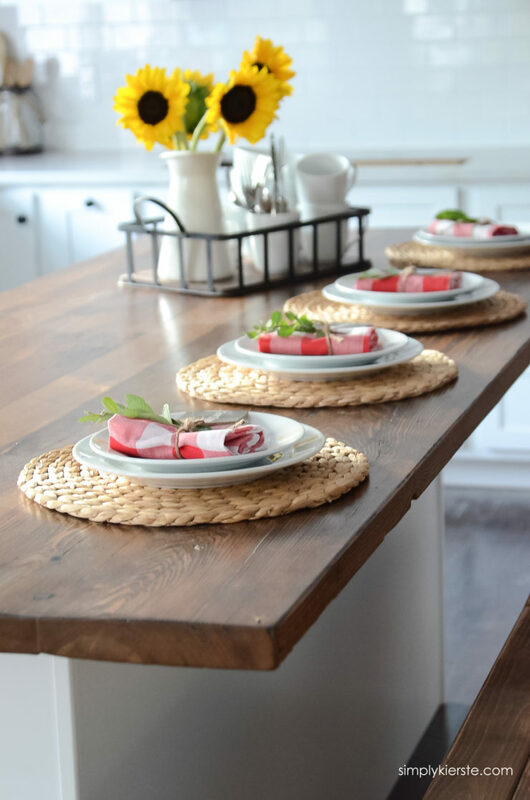 You might also love some of my other Better Homes and Gardens posts, like this sneak peek into my Farmhouse Kitchen! Hey Kierste! As usual everything is super cute. I had a question about the chairs. While I adore them, looking at the dimensions, it’s seems like they would be awfully small. My husband and I are both almost 6′ tall and he weighs over 200lbs. How do you feel about the size of these chairs? I want to use them as dining chairs. Do you think they would be comfortable enough? We have wooden Windsor chairs now. We don’t spend a lot of time in them, I was just concerned about them being big enough. I measured the ones I have now and the dimensions are actually pretty similar. 17″ doesn’t seem like a lot. Thanks for the info. I love reading your blog. 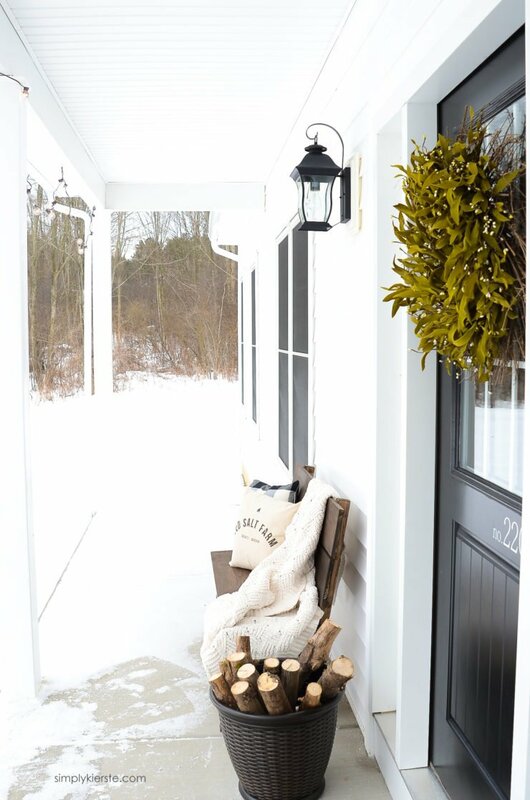 Love your porch, great idea for the logs in the flower pot! 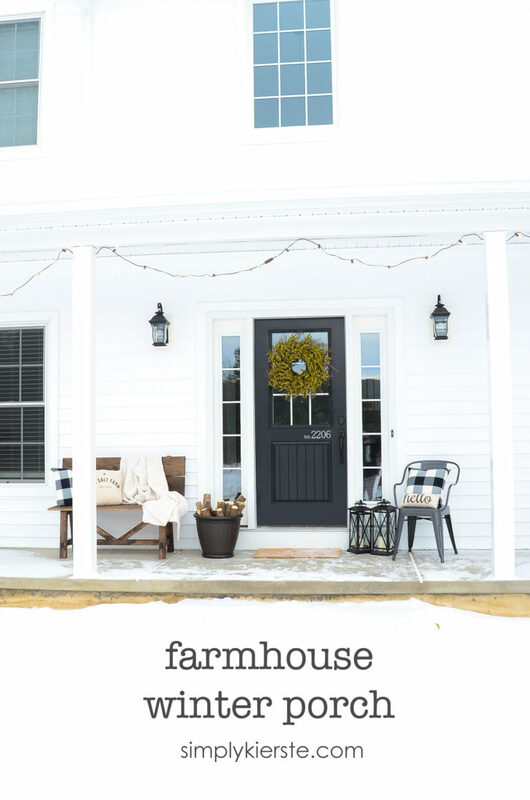 I am in love with your farmhouse! Absolutely picture perfect!! 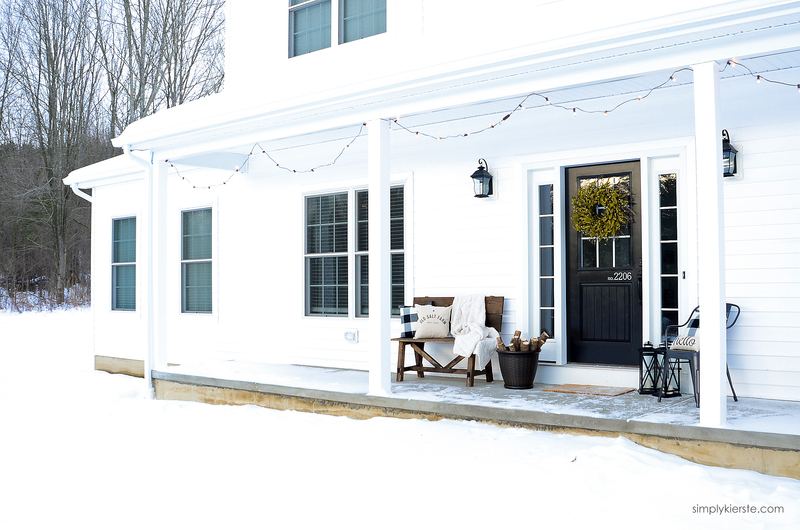 How fortunate it’s protected from the weather – Love the strings of lights too, bet that looks so pretty at night. Thank you so much, Shannon! And yes—the lights are gorgeous at night, I love it! 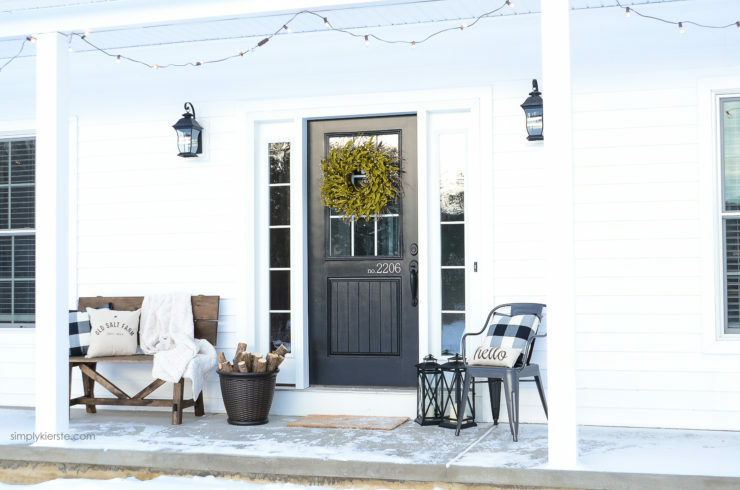 I am having severe porch envy right now! That bench, the pillows, EVERYTHING is perfection! So darling and welcoming, Kierste! You got me motivated to spruce up my porch tomorrow morning. My porch is pretty bare and boring at the moment, ever since I cleared out the Xmas decorations. No point waiting for Spring–you are right, we all need a little cozy entrance. Loving the look! I like the size and font of the address on the door, can you share the details?